Trajan, AD 98 to 117, Silver Cistophorus. 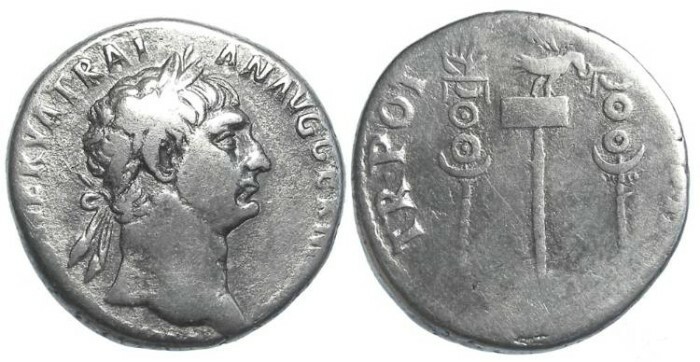 Denomination : Silver Cistophorus (3 denarii). Mint : Pergamon or Ephesus. Reference : RSC-605, RIC-718, Sear-3114. Size : 23.5 x 24.2 mm. Weight : 9.41 grams. Obverse : Head of Trajan right with IMP CAES NERVA TRAIAN AVG GERM P M around (part of the inscription is off the flan at both the beginning and ending). Reverse : Legionary eagle between two standards, with TR POT COS II around (the COS II is mostly of the flan but you can see the bottom of the II).